The idea for a wishing bowl came from The Knot. 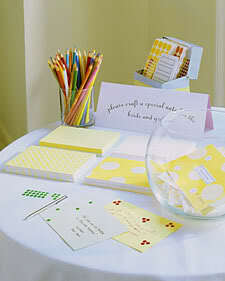 The basic concept is to give guest the opportunity to leave a special note for the bride and groom. Often guest books are just a name and maybe a mailing address. 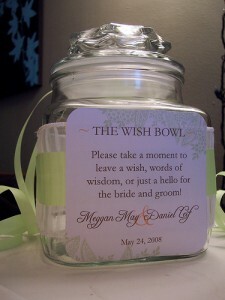 A wishing bowl allows the guest to leave a personalized note for the bride and groom to enjoy after the wedding for years to come. My wishing bowl . . 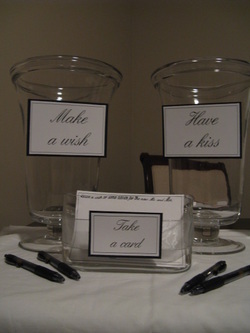 The signs read - "Take a card", "Make a wish" and "Have a kiss". 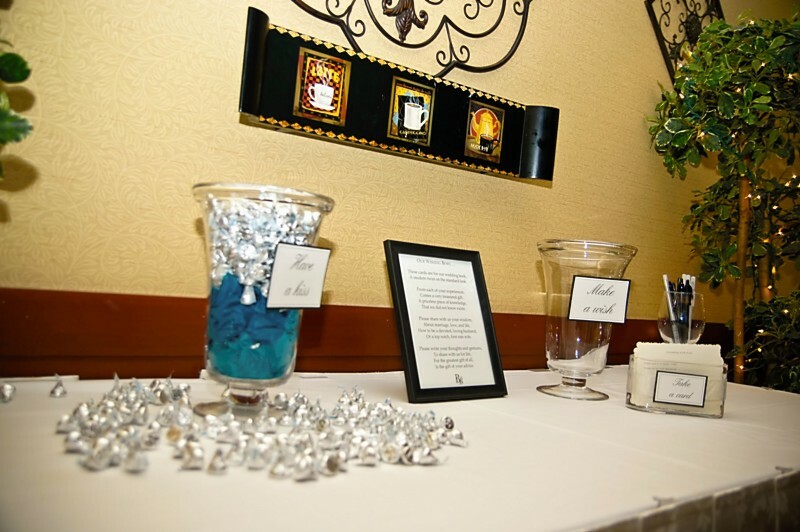 The "have a kiss" vase will be filled with chocolate kisses for the guest to enjoy. Hurricane vases used for the wishing bowl were purchased on clearance at JcPenney. Sale price was $5.97 but I had a coupon for spend $10 get $10 free so I basically for both vases for $2. The vase used for the cards was purchased at Michael's. 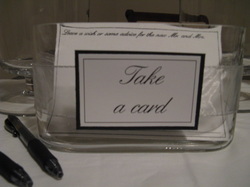 The cards read - "Leave a wish or some advice for the new Mr. and Mrs." I also added the "wish from" line at the bottom so that our guest wouldn't forget to leave sign their name. Each card is 4x6 in size so they will fit into a photo album. I hope to make a scrapbook out of them but just incase this doesn't happen I wanted to ensure they will fit. Wishing bowl sign . .
We will also have a sign in a 8 x 10 frame giving guest a little direction. The sign will read . .
A modern twist on the standard look. That we did not know exists. Or a top notch, first rate wife. Is the gift of your advice. 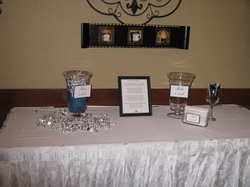 At the reception and how it worked . .
All our guest loved the wishing bowl. We had about 85 guest at the reception and received a wishing card from about 50 of them. Some families did one card for each of them so I'm pretty sure we got a card from each guest. It was great. DH and I had a blast reading through all the cards. Some were serious and some were just plain funny. If you are on the fence about doing this . . . DO IT!